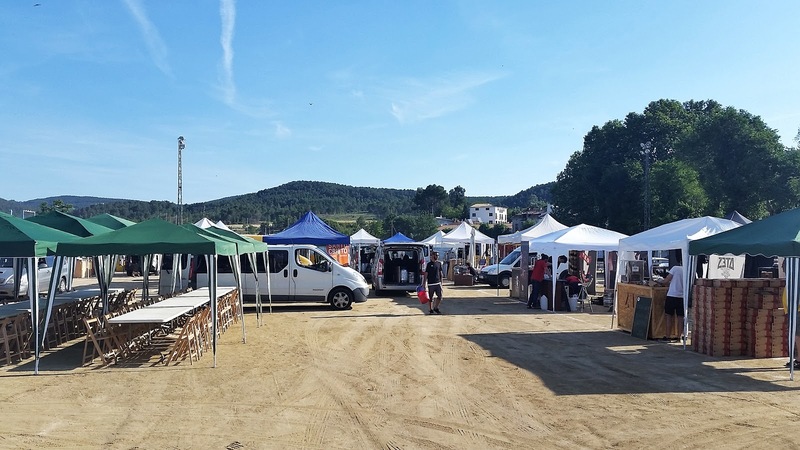 So that's how I arrived early the day before, towards the area of ​​the Municipal Sports Field, the heart of activity where, year after year, Sant Joan de Mediona changes the peace of a 900 inhabitants village to become a huge beer and handicraft festival. But at that time in the afternoon there were basically kids playing ball, some old people walking around, and a wandering stranger who was watching and scribbling things in a small notebook. 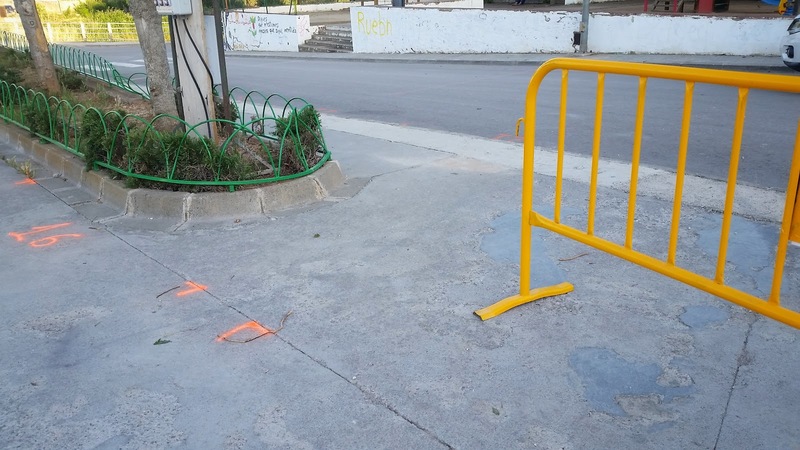 The marks on the ground were a signal that the apparent calm would soon fade, though. I then strolled through the streets, getting to know better the corners of a locality in which I have been many times, although I hadn't explored it much until now. 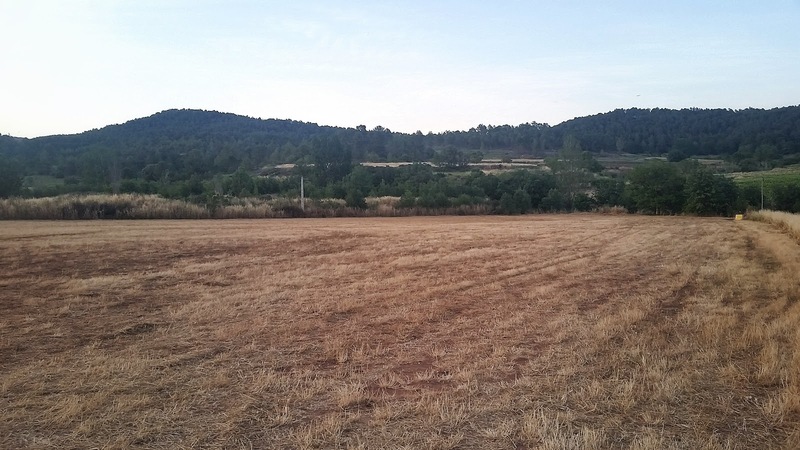 Soon I had traveled a good part of the municipal core, so I ventured aimlessly through some roads, which rewarded me with beautiful landscapes of this quiet part of Alt Penedès: from a bird's eye view of the town to extensive fields and vineyards. 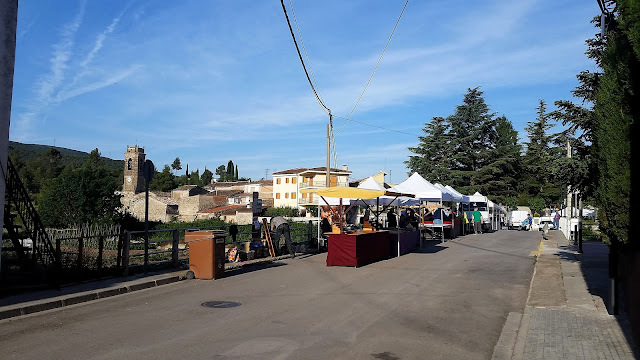 I knew that there was a supper the day before the Mostra, but I didn't worry much as I concentrated on my thoughts while discovering the surroundings of this beloved town for the local beer scene. It was not long before I saw four vans in the distance, clearly following each other, heading for the centre. Considering my options, I finally decided to get closer to the municipal sports area again. The peace that had prevailed during my stay a few hours before, suddenly breaks in half as I hear songs from a group of people who are proudly chanting that they are coming from Murcia. As I approach the area, I see a row of people merrily walking in the same direction. Among them, I am struck by the familiar face of a Dutchman wearing a red shirt, quite taller than the rest. I quickly realise that this is my group: I'm going to have dinner with them. I reach them, say hi and, all of a sudden, my particular twelfth edition of the Mostra de Mediona begins. Kristian Meyenburg, from Popaire, tells me his routine of every edition: they come on Friday to calmly acclimatise; on Saturday, to work hard but happy. And once the madness is over they sleep and leave without any haste on Sunday. Already in the restaurant, I congratulate Montse Virgili for another edition of the festival. She has started the day very early, but with a mischievous smile expresses some fear for how the night will play out, since she is not feeling exhausted as on other occasions. At her side I meet Maria Vicente, from Cerveses Lluna, who tells me how it is the first time they have come since that day, 12 years before, when they attended a wedding precisely in Mediona. And whose reception was in Masia Agullons -Montse and Carlos' home, where they brew their renowned Ales Agullons-. They got to taste their beers, agreed that 'this is what we like', and that coincidence was the trigger that led them to set up, 3 years later, their own brewery. 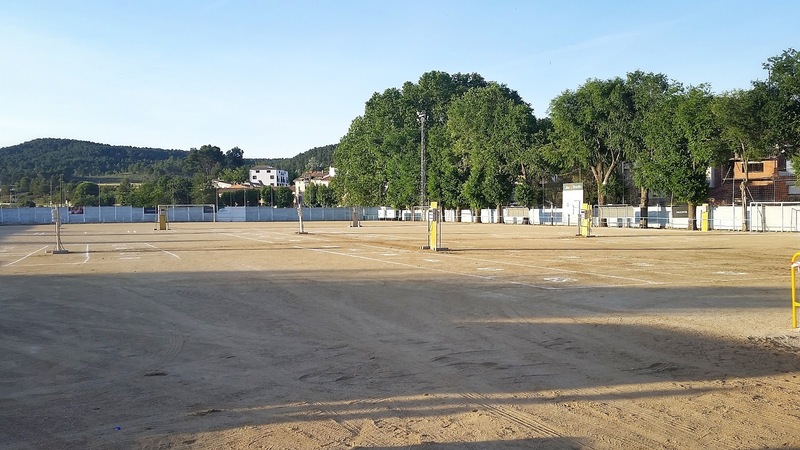 Checking my phone I see that Jofre Pruna, who knew I would not be at the festival, has sent me a picture of the new stand-caravan that the guys at Edge Brewing have assembled for festivals and events: 'for your eyes only, we want it to be a big surprise for tomorrow'. 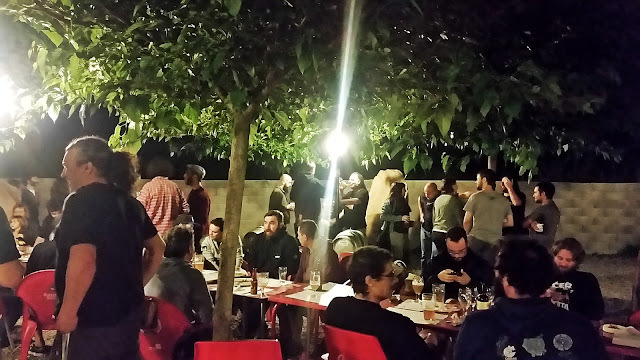 Near the place where I left my things to eat a delicious goat cheese pizza, I join Carlos Rodríguez and Miquel Piqué, who hold a lively conversation about beer and barrels in the pleasant patio of the restaurant. They talk about Cerberus Picapoll -a beer with local Picapoll grapes- and how good a beer it is. I could not agree more. When I get to sit down I meet again with Jordi i Marta, from La Selvaseria. They are thrilled to be there as they tell me how this is their first edition behind the bar, after several years as visitors. Guille Lagardera -Zeta Beer-, with a tired face but a broad smile, is happy to repeat the experience of the previous year. It is not only a great party, but 'you have a specialised public who is very receptive to try everything you bring; it is a great opportunity to evaluate new stuff and maintain a closer contact with the consumer'. The next morning, I get up early and go to visit the sports area. There I find a true festival atmosphere, as the set up of stands takes place. Among the brewers, some new faces in relation to yesterday, and a general expression that indicates fewer hours of sleep than me. Plus a greater dedication the night before. I greet one of my fixed annual visits at the festival: Pepe, from La Font del Diable. This year I will not be able to try his great beers, but we will soon meet again. I also say hi to Jordi Llebaria, brewer at Montseny, who tells me that Cursa de la Cervesa -a running & beer event- was a success. There will be a second edition next year, which makes me happy, as it seems to me another great way to reach a receptive audience for craft beer, such as the popular runners. Before I leave, I get my glass of the XII edition: later I will fill it with beer to toast at a distance to everyone of them. 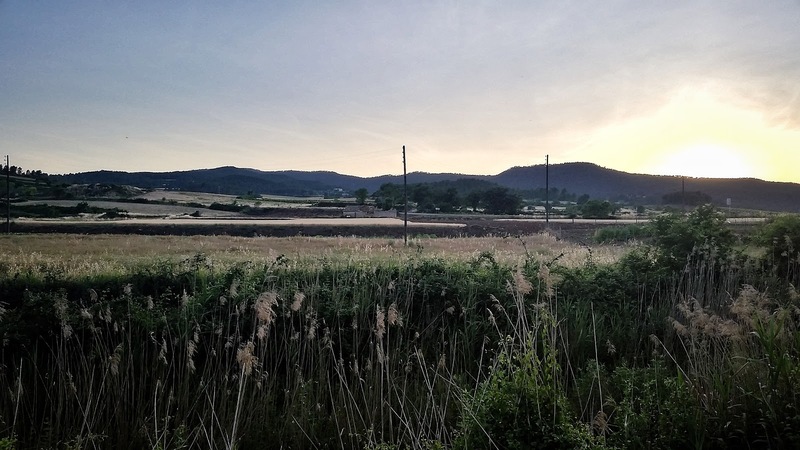 Because every year I get to know many personal stories that fill with human content my visit to this tiny area of the Catalan geography. Stories about the work and life, about comradeship; about exhibitors who come from afar and get stuck with their car in the middle of the road, to be later picked up by fellow exhibitors who drive back to help them. Or about brewers who, without any concern, leave their booth with a sign of 'please yourself' as they want to go and enjoy the beers of their 'competitors'. How shouldn't I look for alternatives to feel that I had, somehow, also been part of this twelfth edition? In the end you see that what makes Mediona special is the eagerness it brings to people: from those who design each year's edition with all the affection from their farm, to the one who manages and sorts the assembly of stands with a smile from the very first hour of the Festival. Or the brewer who has lived days of unbearable heat and the occasional downpour in editions over more than a decade. Each of the attendants and visitors, as well as the town neighbours who throw themselves unconditionally into the event, feel the Mostra as their own. This is what makes it truly special. 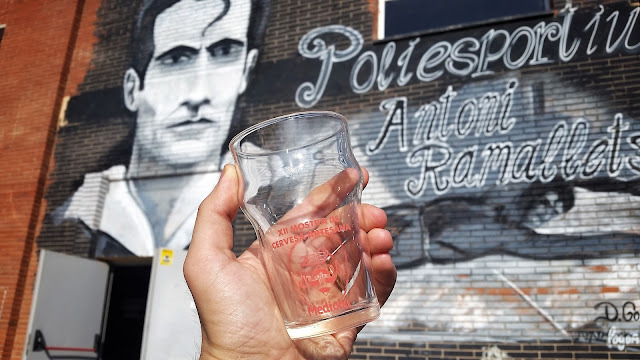 The group of people that congregates in Mediona is one of the great pillars that, year after year, inspires our local beer scene. Something that has to be experienced to have a better understanding of the beer community in this country, and the kind approaches that can be motivating for it. We all carry a bit of Mediona inside of us.